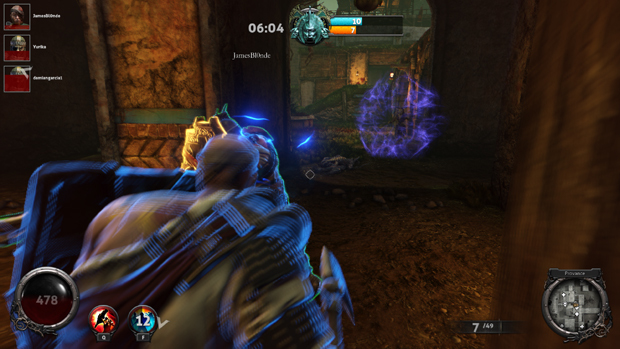 Nosgoth has recently left Closed Beta and officially entered Open Beta last month. 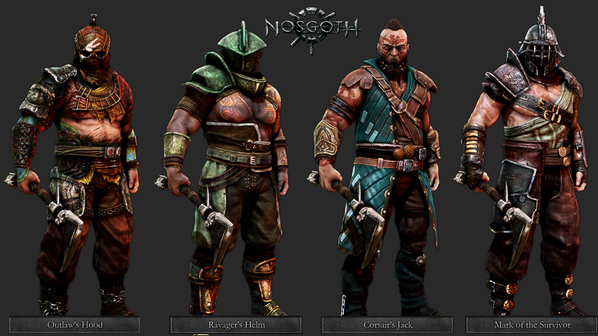 Since then, the Nosgoth team has been working hard to release new content for their players. Such as new classes like the Summoner. And tomorrow, Wednesday the 25th, (Editor’s Note: Patch has been delayed. We’ll provide more info when available) we see the release of another new class – The Vanguard. Luckily, I was given the chance to try it out before its official release. Here are my First Impressions of the Vanguard. The Vanguard has an odd bit of lore. The name suggests something noble, but then you find that the Vanguards are made up of the vile scum and villainy of the land, described as a “mixture of convicts and overseers who together survived the Vampire assault on the Isle of the Dead.” They refer to themselves as the Drowning Men and attract those of a less savory sort. So you have these criminals taking up the role of Vanguard for the human faction, putting themselves at risk to combat the Vampire hordes. The Vanguard, as the name suggests, is meant to be at the forefront of the battle clearing a path for your allies. To accomplish this, you have a massive tower shield at your disposal. By right clicking you can bring up your shield to help protect you from forward damage. You’ll still be susceptible to attacks from behind, but raising your shield can allow you to lead your allies into the foray. 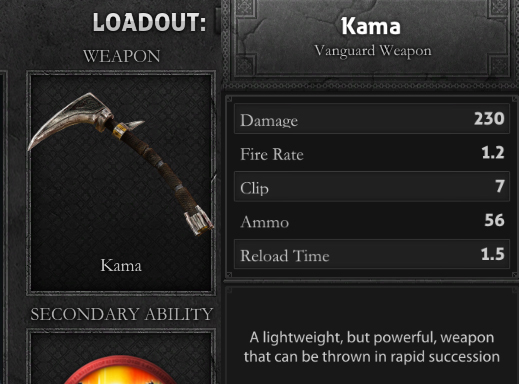 The Vanguard makes use of various axes – such as the Kama and Waraxe – which he hurls at enemies to do ranged damage. Whether you’re stopping the slaughter of a friend or keeping an enemy from running away, you’re going to find the ranged attacks very useful. So far there are four different weapons to choose from, each having their own bonuses and negatives. Such as a small “clip” or throw speed, but high damage. Early on, I found myself trying to get as close to an enemy as possible while tossing the axes into his face point-blank, treating it like a melee weapon. So the Vanguard had me a bit surprised when this style of gameplay wasn’t paying dividends. By the way the character looks – massive shield on one arm and an axe in the other – I got the impression that perhaps the humans were going to see a melee-focused class. However, I should have known better (all humans, at least so far, are ranged-oriented), as that axe isn’t for cutting. No, it’s for throwing. I found myself making a lot of ranged-based kills (even stealing some kills, sorry!) thanks to my handy axe. The archetype is overall odd. It looks like a tank, yet packs some powerful offensive ranged capabilities, and even some support utility (which I’ll get to shortly). The best description I could come up with is a Warrior-tank-support hybrid. The Vanguard seems to do it all, often making you feel like the hero of the match no matter how well (or poorly) you do. Of course, the Nosgoth team came up with a better name and simply called it Vanguard, which describes the class perfectly. As I played, I quickly found myself falling into the role of initiator. I would charge in with my shield, keeping it up for the enemy beat on me while my allies took him down. If fights dragged on a bit too long, I could cast my support skill to prolong the battle in our favor, or prepare us for any meddlers that might interfere. 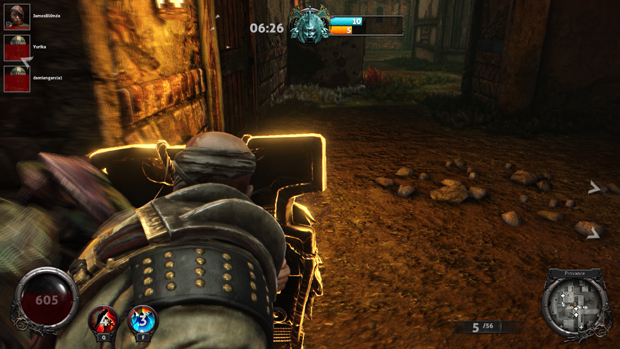 However, I also acted as a finisher, as I could do a shield charge to get close to fleeing enemies (or knock them down if they get hit) and spam axes into the middle of their back as they limped away. Needless to say, my time playing the Vanguard was very satisfying. Like all classes in Nosgoth, the Vanguard has a primary and a secondary ability. There are three Primary abilities to choose from – Shield Charge, Judgement, and Shield Bash. Shield Charge and Shield Bash should be pretty self-explanatory. One charges into enemies, knocking them over. The other allows you to bash a close-by enemy, temporarily disorienting them. Judgement is a different cookie, a big AOE that does decent damage but also will instantly kill those with low HP. More often than not, I found myself using Shield Charge as it allowed me to get into (and out) of fights fast. Right now, there is only one Secondary available. 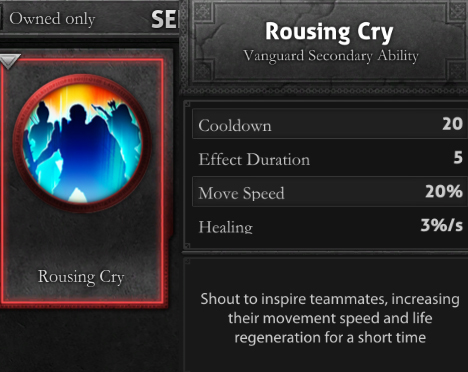 It’s known as Rousing Cry and is a buff/heal. It lasts five seconds and is an AOE, so everyone nearby benefits. Any nearby allies will receive a 20% speed buff AND a 3% (of HP) per second Healing Over Time effect. You can imagine how both can turn a fight around in an instant. You can give your allies just a bit more health, allowing them to take down whoever they’re fighting. Or help them flee from a fight or chase down enemies. I found myself relying heavily on this move – I would try to activate it during and after every fight at a minimum. This is the ability that, I think, really lets the Vanguard live up to its name. Like every other class, the Vanguard comes with skins. The class is launching with four skins (the default skin making five), each depicting a different aspect of the class’ lore. 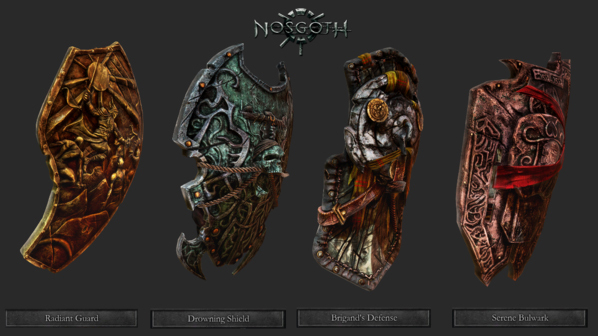 However, the Nosgoth team has noticed the communities want for more customization options and have introduced a new customizable item – the shield. So, along with the four class’s skins, there are also five (including the default) shield skins available. These shield skins aren’t attached to a specific over-all skin, so you can mix the two to give yourself a more unique look. The Vanguard is an interesting class, to say the least. It’s a great addition to the Human faction and a blast to play. It’s capable of supporting many different play styles, so most people will probably enjoy playing as it. 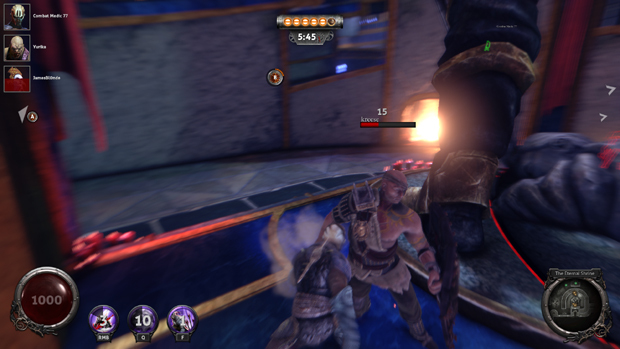 To be honest, until the Vanguard I never had much fun playing as the humans in Nosgoth, but now I think I’ve found a new favorite class. Personally, I can’t wait to see what the Nosgoth team comes up with next because, judging by the dynamite content updates that have been coming out this year, it should be amazing. Want to see the Vanguard in action? Subscribe to the MMOHuts’ Youtube for an upcoming video with JamesBl0nde!